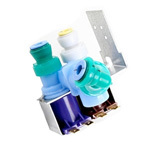 The water inlet valve has two ports for water to enter and controls the flow of water into a washing machine. Hot, cold, and warm water can easily enter the washer this way. This part works with the following brands: Frigidaire, Kenmore, Gibson, Kelvinator, Westinghouse, Tappan, Crosley, Electrolux, Uni. 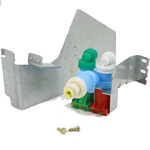 This part works with the following products: Washer, Washer Dryer Combo.